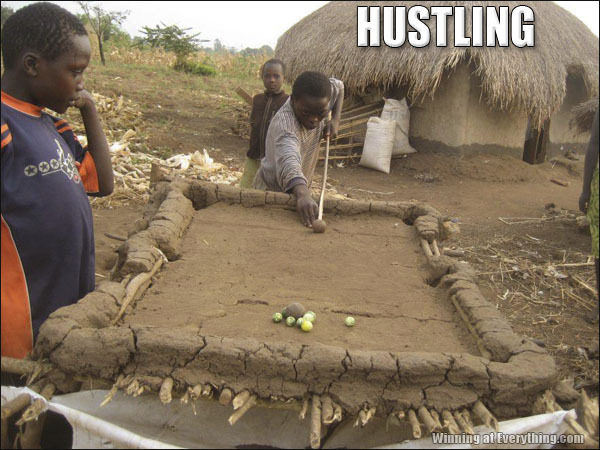 Laugh all you want, but come the zombie apocalypse, the man with a mud and stick pool table will rule Bartertown. Break a deal, spin the wheel! Sadly, the next day, they found that dung beetles had made off with most of the table. Sadly, the fight over who gets to be called “Kenyan Slim” has claimed many, many lives. You should check out the sweet flat screen in his hut; it’s an LCD (Liquid Clay Display). Moments later the game was called on account of rain. And slump. Don’t worry. One day, they’ll get a real pool table when Madonna or Jolie adopts them.